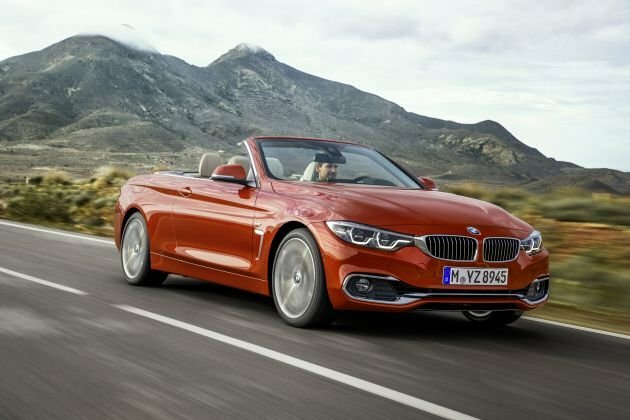 The 2017 BMW 440i xDrive Convertible is the middle brother in the BMW convertible lineup. It is larger and more polished than the smaller 2 Series convertible, but smaller and more nimble than the fancy big brother 6 Series convertible. The 440i xDrive Convertible has a unique feature – a retractable hardtop. This results in a four-seater convertible that converts to a closed coupe when the top is raised. You get two cars in one! You will lose some trunk space when the top is folded, but you can still access the remaining usable area. This car is an excellent choice if you plan to use it in really bad weather conditions. Powering the BMW 440i xDrive Convertible is a 320-hp BMW TwinPower Turbo six-cylinder engine. This is a significant amount of lag-free turbo power, but the 440i xDrive Convertible performs like a BMW should. The xDrive all-wheel drive system maximizes your grip in all conditions, and the balanced chassis lets you control the car to the limits of your abilities. This is a great driving car.